Genome wide association studies (GWAS) have identified several genetic variants that are associated with prostate cancer. Most of these variants, like other GWAS association signals, are located in non-coding regions of potential candidate genes, and thus could act at the level of the mRNA transcript. We measured the expression and isoform usage of seven prostate cancer candidate genes in benign and malignant prostate by real-time PCR, and correlated these factors with cancer status and genotype at the GWAS risk variants. We determined that levels of LMTK2 transcripts in prostate adenocarcinomas were only 32% of those in benign tissues (p = 3.2 × 10-7), and that an independent effect of genotype at variant rs6465657 on LMTK2 expression in benign (n = 39) and malignant tissues (n = 21) was also evident (P = 0.002). We also identified that whilst HNF1B(C) and MSMB2 comprised the predominant isoforms in benign tissues (90% and 98% of total HNF1B or MSMB expression), HNF1B(B) and MSMB1 were predominant in malignant tissue (95% and 96% of total HNF1B or MSMB expression; P = 1.7 × 10-7 and 4 × 10-4 respectively), indicating major shifts in isoform usage. Our results indicate that the amount or nature of mRNA transcripts expressed from the LMTK2, HNF1B and MSMB candidate genes is altered in prostate cancer, and provides further evidence for a role for these genes in this disorder. The alterations in isoform usage we detect highlights the potential importance of alternative mRNA processing and moderation of mRNA stability as potentially important disease mechanisms. Cancer of the prostate is the most common male malignancy in the Western world, accounting for 25% of all male UK cancers (taken from http://info.cancerresearchuk.org/cancerstats). Although survival rates are increasing, cancer of the prostate remains the second most common cause of cancer death in UK men after lung cancer. Several risk factors have been identified, the main factors being age , family history  and ethnic origin . Prostate cancer is uncommon in men under 50 years old, but 80% of men aged over 80 years were found to have cancerous cells in their prostate at the time of death . Estimates suggest that between 30 - 40% of all early onset cases of prostate cancer (< 55yrs) are caused by inherited factors , highlighting the importance of genetics in this disorder. Early-onset prostate cancer that aggregates in families is likely to result from the inheritance of rare genetic variants that have a large impact. Several strong risk factors have been identified from family studies which include mutations in the ELAC2, RNASEL and MSR1 genes involved in immune response  and the BRCA1 and BRCA2 genes involved in the development of breast cancer . Despite increases in the understanding of the familial forms of prostate cancer, the aetiology of the remaining 60% of cases remains unclear. The advent of genome wide association studies (GWAS) has resulted in a dramatic increase in the number of susceptibility loci that have been associated with the development of prostate cancer (table 1). Four independent studies in the Icelandic, UK and American populations have identified more than 20 distinct genomic locations as being implicated in susceptibility to prostate cancer [6–9]. Loci that have been identified as significant determinants of prostate cancer risk in four independent genome wide association studies. MAF = minor allele frequency in the HapMap CEU population. Many of the GWAS association signals identified are located in regions of the genome that are not translated into protein. This may indicate that the associated marker is in close linkage disequilibrium with an uncharacterised variant in the protein coding region, or that the functional SNP may cause its effect by epigenetic or histone modification. The other possibility is that the variant may act at the level of the messenger RNA. There are several mechanisms by which variants in non-coding regions of the mRNA transcripts could affect gene function. Firstly, if the variant lies in the promoter or 5' untranslated region of the transcript, it may interfere with the efficiency of transcription or translation, as has been shown to be the case for several human and rodent genes [10–12]. Variants located within the intronic sequences may interfere with mRNA splicing . The production of aberrant splice products has previously been shown to be very important in the aetiology of cancer in general [14, 15], but may contribute to the biological heterogeneity of prostate cancer in particular . Finally, polymorphisms located in the 3' untranslated region may disrupt regulatory elements necessary for mRNA stability, interfere with regulation of translation by microRNAs or influence the polyadenylation dynamics of the transcript [17–19]. In this series of experiments, we sought to investigate whether the genes suggested by the GWAS for prostate cancer were differentially expressed in malignant prostate tissues, and whether their expression was influenced by genotype at the GWAS risk variants. Seven genes were selected for study (figure 1). We measured the total or isoform specific gene expression of the JAZF1 (JAZF zinc finger 1), CTBP2 (C-terminal binding protein 2), LMTK2 (lemur tyrosine kinase 2), SLC22A3 (solute carrier family 22 extraneuronal monoamine transporter, member 3), MYEOV (myeloma overexpressed), MSMB (microseminoprotein beta) and HNF1B (HNF homeobox 1 beta) in a cohort of 39 non-malignant benign prostatic hyperplasia (BPH) samples and 21 prostate adenocarcinoma samples, and correlated gene expression with cancer status and with the genetic variants identified in the GWAS (table 1). We demonstrate two of the eight variants are correlated with gene expression levels in non-malignant prostate tissues, and that the presence of adenocarcinoma is associated with altered gene expression levels and differential expression of alternatively processed isoforms for three of the candidate genes in prostate tissue itself. Schematic representation of the structure of transcripts studied here. 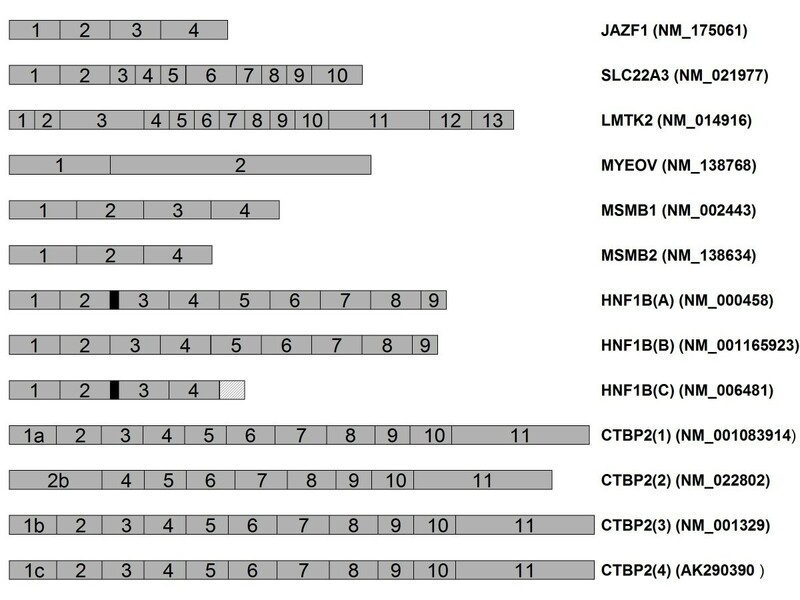 The structure of the JAZF1, SLC22A3, LMTK2, MYEOV, MSMB, HNF1B and CTBP2 mRNAs are represented here, together with their RefSeq ID numbers. Exons are represented by numbered grey boxes. The black box represents the section of exon 3 absent from isoform HNF1B(B). The section of intronic sequence present in HNF1B(C) is indicated by a hatched box. The prostate samples in this study were obtained from the Exeter tissue bank, and comprised prostate chippings taken during routine transurethral resection of the prostate (TURP). Both cancer and BPH groups originated from a population of older men treated for urological problems at the Royal Devon and Exeter Hospital, Exeter, UK and were predominantly of Caucasian origin. Samples were flash frozen in liquid nitrogen upon removal, and stored at -80°C until required. Subjects with benign prostatic hyperplasia (n = 39) had no sign of prostate malignancy at the time the samples were taken, and none had received a subsequent diagnosis of prostate cancer 5 years following their diagnosis of benign prostatic hyperplasia (BPH). The median age of the BPH cohort was 83 years (IQR 78,88) and the median age of the prostate cancer cohort was 83 years (IQR 76,87). 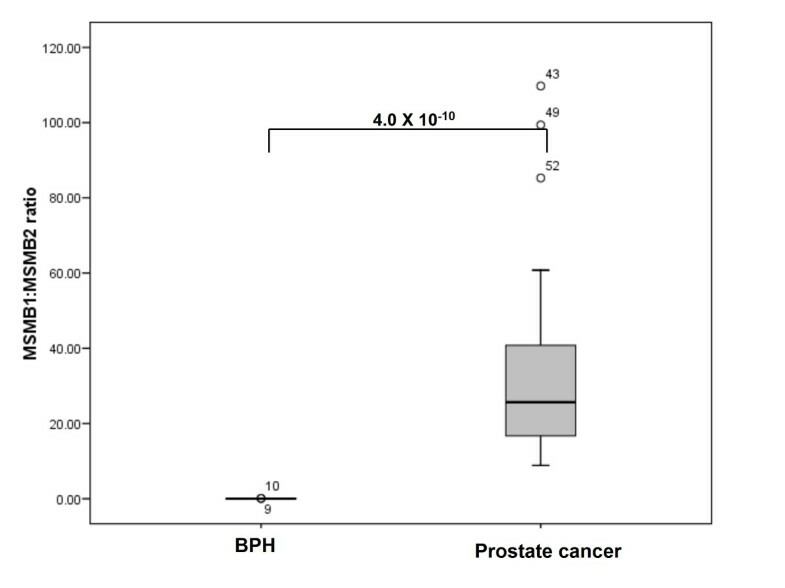 BPH samples were used as the control group for several reasons; firstly, most males have evidence of BPH by the age of 70 or 80, so the presence of some degree of BPH is 'normal' at the median age at diagnosis in our prostate cancer cohort (77 yrs, [IQR 72,82]). Truly 'normal' prostate tissue would thus only be obtained in a much younger control cohort, which could introduce bias. Secondly, since collection of prostate tissue requires a surgical procedure, which would only be undertaken in subjects with evidence of symptoms of prostate enlargement. Even then, morphologically normal tissue may harbour premalignant genetic abnormalities that are not immediately obvious. However, we acknowledge that genetic heterogeneity between patients and controls may influence the gene expression from individual to individual. Prostate cancer samples (n = 21) underwent confirmation of cancer status, histology and Gleason scoring by dissection of the TURP chips and subsequent histological examination of tissue from either side of the sample used for RNA analysis. All cancer samples were classified as prostatic adenocarcinomas, of which 57% were Gleason score 6 or 7, and 43% were Gleason score 8-10. Further analysis of patient case notes revealed that 8/19 prostate cancer patients and 6/37 Benign Prostatic Hyperplasia patients had been exposed to hormone treatment (Zoladex, Finasteride, Casodex or Proscar). All participants had consented to their tissue being used in this study, and ethical approval was obtained from the South West Research Ethics Committee. This study was carried out according to the Declaration of Helsinki. DNA was extracted from prostate chippings using the Qiagen DNA mini kit (Qiagen, Crawley, UK) using standard procedures on the fully automated QiaCube sample preparation platform (Qiagen, Crawley, UK), following manual homogenisation of tissue. Seven candidate genes were identified for expression analysis. These were chosen on several criteria. Firstly, we chose our candidate genes on the basis that the GWAS index SNPs were located within the gene sequence itself, or very close to the genes in question. The linkage disequilibrium blocks identified in the GWAS may contain other genes (or variants) that may contribute to the risk of developing prostate cancer, the majority of these are located remotely to the association signal and do not represent better biological candidates. Secondly, all seven are good biological candidates, having roles in cell proliferation, regulation of apoptosis or prostate development and function. Analysis of the linkage disequilibrium structure around the GWAS index SNPs revealed several other candidates, but these were not analysed due to a lack of expression in the prostate, a lack of convincing biological evidence for a role in prostate function or the presence of more plausible candidate genes. The remaining four signals located on chromosomes 3, 8, 19 and X were not analysed due to the lack of an obvious candidate gene. Genotyping was carried out by PCR amplification and direct sequencing of the sequence flanking the variant in question; primers and conditions are available on request. Amplification reactions contained 10 μl Megamix Royal (Microzone, Haywards Heath, UK), 10 μM primers and 50 ng DNA in a total volume of 20 μl. Sequence specific primers for each amplicon were tagged with 5' M13 tails to allow sequencing to be performed with a universal M13 primer. Single-strand sequencing was carried out using standard methods on an ABI 3730 (Applied Biosystems, Warrington, UK). Sequences were compared to a designated individual homozygous for the major allele of the variant using Mutation Surveyor (version 3.20; SoftGenetics, State College, PA). RNA was extracted from prostate chippings using the Qiagen RNAeasy kit (Qiagen, Crawley, UK) on the fully automated QiaCube sample preparation platform (Qiagen, Crawley, UK), following manual homogenisation of tissue with an additional pass through a Qiagen Qiashreddder column (Qiagen, Crawley, UK) column to shear genomic DNA. RNA samples were stored at -80°C prior to analysis. Approximately 500 ng of mRNA from each sample was treated with 1u of RNAse-free DNAse (Promega, Madison, USA) for 30 minutes at 37°C followed by 65°C for 10 minutes for nuclease inactivation. Complementary DNA (cDNA) was synthesized from mRNA using the Superscript III VILO RT-PCR system (Invitrogen, Paisley, UK) according to manufacturer's instructions, with an incubation temperature of 42°C and a reaction volume of 40 μl. Real-time PCR reactions using target-specific probes were carried out in triplicate using the ABI Prism 7900 HT platform (Applied Biosystems, Warrington, UK) and contained 5 μl TaqMan Fast Universal Mastermix (no AMPerase) (Applied Biosystems, Warrington, UK), 0.9 μM each primer, 0.25 μM probe and 2 μl cDNA reverse transcribed as above in a total volume of 10 μl. PCR conditions were a single cycle of 95°C for 20 seconds followed by 50 cycles of 95°C for 1 second and 60°C for 20 seconds. Individual probe and primer sets were pre-validated off-the-shelf assays to specific transcripts provided by Applied Biosystems (Warrington, UK; Assay identification numbers available on request). The relative expression level of each isoform was then determined relative to the B2 M and GUSB transcripts by the comparative (ΔΔCt) method . The abundance of each target in each individual was normalized to the average measurement for the transcript in question across the cohort prior to correlation of expression levels with genotype. Measurement of the relative abundance of transcripts bearing different alleles at variant rs3801294, in perfect linkage disequilibrium (r2 = 1; D' = 1) with the LMTK2 index SNP rs6465657, was carried out in single tube reactions by allele-specific real time PCR. PCR amplicons were generated by a common set of primers for both alleles, but transcripts bearing different alleles were discriminated by the use of allele-specific probes labelled with different fluorochromes (6-fluorescein [6-FAM] and VIC); probes and primers available on request. This allows a measurement of transcript abundance that is independent of amplification efficiency. Real-time PCR reactions using were carried out in triplicate using the ABI Prism 7900 HT platform (Applied Biosystems, Warrington, UK) and contained 5 μl TaqMan Fast PCR Master Mix, no AmpErase™ (Applied Biosystems, Warrington, UK), 72 μM each primer and 16 μM each probe) in a total volume of 10 μl. PCR conditions were a single cycle of 95°C for 20 seconds followed by 60 cycles of 95°C for 1 second and 60°C for 20 seconds. The expression level of transcripts bearing the G allele (marking the C allele at rs6465657) was then calculated relative to that of transcripts bearing the A allele (marking the T allele at rs6465657) by the comparative (ΔΔCt) method , as we have done for several previous studies [21, 22]. Quantifications were then compared to the average measurement obtained from eleven independent DNA samples, which should provide a known 50:50 mix of A and G-bearing transcripts, in order to control for differences in probing efficiencies. The statistical significance of apparent differences in gene expression levels was investigated by Kruskal Wallis analysis for multiway comparisons and by Mann Whitney-U analysis for pairwise comparisons. Non-parametric statistics were employed due to the relatively small sample numbers and the fact that the data obtained were not normally distributed. In the case of the association between LMTK2 expression and cancer status, linear regression was carried out on natural logarithmically transformed data to allow adjustment for the effect of genotype at rs6465657, which we found to be independently associated with LMTK2 expression. All statistical analyses were carried out using SPSS v15.0 (SSPS PLC, Chicago, USA). We obtained 426/480 genotypes for the 8 GWAS variants in our cohort of 39 benign prostatic hyperplasia specimens and 21 prostate adenocarcinoma samples (310 for the BPH cohort and 116 for the cancer cohort). All three genotypes were detected for the variants, with the exception of minor allele (C) homozygotes for rs4962416 within the CTBP2 gene, as expected given the minor allele frequency of only 0.229 in the HapMap CEU population. Analysis of potential correlations between genotype at the GWAS association loci and isoform-specific gene expression of nearby candidate genes revealed correlations between risk genotype at the GWAS variants rs6465657 and rs4962416 with the expression of LMTK2 and CTBP2 respectively. Individuals carrying two copies of the protective T allele of rs6465657 expressed almost a third less LMTK2 mRNA than did individuals carrying one or two copies of the risk 'C' allele (0.68 [Interquartile range [IQR] = 0.63] v/s 1.18 [IQR = 0.56]; P = 0.007). Similarly, individuals homozygous for the 'T' allele at rs4962416 expressed 37% less of a partially characterised isoform of CTBP2; CTBP2(4), than did individuals with CT genotypes (0.82 [IQR 0.83] v/s 1.31 [IQR 0.96]; P = 0.009). Although neither of these findings quite reaches full statistical significance following adjustment for multiple testing (P = < 0.004 for 12 independent tests), they do indicate that these genes are worthy of further study. We measured the abundance of each LMTK2 allele of rs6465657 in 17 heterozygous individuals, and determined that transcripts bearing the rs3801294 'A' allele, which is in perfect linkage disequilibrium (r2 = 1; D' = 1) with the protective 'T' allele at rs6465657, were significantly less abundant in heterozygous BPH tissues than were those carrying the 'G' allele, linked to the 'C' allele of rs6465657. The ratio of protective 'A' alleles to risk 'G' alleles in heterozygous individuals is 0.65 [IQR 0.12]:1 [IQR 0.33]; P = 3.3 × 10-5, figure 2), which remains statistically significant after adjustment for multiple testing. This provides further evidence for a role of LMTK2 in determining susceptibility to prostate cancer. No correlations of genotype with expression levels were noted for the remaining isoforms of the CTBP2 gene, or any isoform of the JAZF1, MYEOV, SLC22A3, HNF1B or MSMB genes in BPH tissues. Allele-specific expression of LMTK2 transcripts. This histogram demonstrates allele-specific differences in the expression of LMTK2 transcripts bearing either the G or A allele at rs3801294, which is in perfect linkage disequilibrium (r2 = 1; D' = 1) with the index SNP rs6465657. The sample identity is given on the X-axis and the ratio of transcripts carrying G alleles (marking the C allele of rs6465657) relative to those carrying the A allele (marking the T allele at rs6465657) is given on the Y-axis. Error bars represent the interquartile range (IQR) of the measurements. The level of significance as determined by pairwise Mann Whitney-U analyses is indicated by asterisks. We correlated expression levels at each of the loci with prostate cancer status (table 2). We found that expression levels of the LMTK2 gene were also inversely correlated with the presence of prostate cancer. Tumour samples expressed 68% less LMTK2 mRNA than did non-malignant BPH samples (figure 3; relative expression levels were 1.10 [IQR 0.77] in BPH versus 0.35 [IQR 0.30] in prostate cancer; p = 2.4 × 10-7), after correction for the potential effect of genotype at rs6465657. Amongst the eight members of the prostate cancer cohort who had exposure to antiandrogenic drugs, no effect of prior hormone treatment on the expression levels of LMTK2 was noted (0.49 [IQR 0.29) for untreated subjects versus 0.32 [IQR 0.30] in treated subjects; P = 0.270). Total expression levels of candidate genes in non-malignant and prostate cancer tissues. Gene expression levels are analysed relative to the beta 2 microglobulin (B2M) and beta glucorinidase (GUSB) genes, and normalised to the average value in the non-malignant samples. The interquartile range is given in parentheses. A P value of 0.007 (P = 0.05/n° of tests) was taken to indicate statistical significance following correction for multiple testing (7 independent tests). Statistically significant results are indicated in bold italic type. Expression of LMTK2 transcripts is reduced in prostate cancer. This boxplot gives the cancer status (benign prostatic hyperplasia or prostate adenocarcinoma) on the X-axis, and the expression of the single isoform of the LMTK2 gene relative to the endogenous controls beta-2-microglobulin (B2M) and beta-glucorinidase (GUSB) on the Y-axis. Error bars represent the interquartile range (IQR) of the measurements. The level of significance as determined by linear regression of natural logarithmically transformed data is indicated. Outliers are indicated by circles. We also noted differences in the total expression of the SLC22A3 and CTBP2 genes in BPH compared with prostate cancer. CTBP2 and SLC22A3 mRNA levels were reduced by 27% and 50% in prostate cancer tissues compared with BPH tissues (4.2 [IQR 2.5] v/s 2.1[IQR 1.6]; P = 0.008 for CTBP2 and 0.48 [IQR 0.75] v/s 1.01 [IQR 1.42]; P = 0.015 for SLC22A3). CTBP2(1) and CTBP2(4) transcripts showed a trend towards lower expression in prostate cancer subjects treated with hormone therapy (CTBP2(1) ; (0.87 [0.40] in untreated subjects versus 0.31[IQR0.17]; p = 0.006) and CTBP2(4) transcripts (1.01[IQR 0.99] in untreated subjects versus 0.45 [IQR0.42] in treated subjects; p = 0.006) but these results do not reach statistical significance following adjustment for multiple testing (P = < 0.004 for 12 independent tests). This observation was also not noted in the BPH cohort (P = 0.77 and 0.69 for CTBP2(1) and CTBP2(4) respectively. No association of cancer status with expression level was found for a control gene (SFRS protein kinase 1; SRPK1), not known to be associated with prostate cancer in any GWAS. We did not identify any correlations of total gene expression with cancer status for the JAZF1, MSMB, HNF1B, MYEOV or CTBP2 genes. No correlations with transcript expression were noted for cancer stage (assessed by Gleason grading of the cancer) or with exposure to antiandrogenic drugs for any other transcripts analysed in either prostate cancer or BPH cohorts. Although we found no differences in total HNF1B, CTBP2 or MSMB expression between BPH and prostate cancer cases, these genes are alternatively processed. We therefore sought to determine if there were differences in the relative balance of isoforms within our sample cohort (table 3). We found highly significant disturbances to the profile of isoforms expressed in prostate cancer in the case of the MSMB and HNF1B genes. In BPH tissues, the primary isoform expressed at the MSMB locus is MSMB2, which comprises 98% of MSMB expression in this tissue type. However, in cancer tissues, there is a near complete switch to isoform MSMB1, which is present at 96% total MSMB expression in prostate cancer. The ratio of MSMB1:MSMB2 isoforms is altered from 0.02 [IQR 0.02]: 1 in BPH tissue to 25.7 [IQR 30.2]: 1 in prostate adenocarcinoma tissues (P = 4.0 × 10-10, figure 4). In the case of the HNF1B gene, coding for 3 isoforms, we noted a similar switch in isoform expression. The predominant isoforms in BPH samples is HNF1B(C), present at 90% of total HNF1B expression. In prostate cancer tissues however, isoform HNF1B(B) is predominant at 95% total HNF1B expression, with the levels of HNF1B(C) dropping to only 3%. The proportion of isoform HNF1B(A) does not change. The ratio of HNF1B(B):HNF1B(C) isoforms changes from 0.7 [IQR 0.22]: 1 in BPH to 35.4 [IQR 124.71]: 1 in prostate cancer tissues (P = 2.9 × 10-9; figure 5). We also found 47% and 50% reductions in CTBP2(1) and CTBP2(4) expression levels in prostate cancer tissue compared with benign prostate tissues (P = 0.009 and 0.007 for CTBP2(1) and CTBP2(4) respectively), but these values do not reach statistical significance following adjustment for multiple testing (P = < 0.003 for 12 tests). Previous exposure to antiandrogenic drugs did not affect the ratio of MSMB or HNF1B splice variants in samples from prostate cancer or BPH patients (P = 0.24 in untreated subjects and 0.69 in treated subjects for prostate cancer cohort and P = 0.88 24 in untreated subjects and 0.72 in treated subjects for the BPH cohort). Isoform-specific expression levels of candidate genes in non-malignant and prostate cancer tissues. Gene expression levels are analysed relative to the beta 2 microglobulin (B2M) and beta glucorinidase (GUSB) genes, and normalised to the average value in the non-malignant samples. The interquartile range is given in parentheses. A P value of 0.006 (P = 0.05/n° of tests) was taken to indicate statistical significance following correction for multiple testing (8 independent tests). Statistically significant results are indicated in bold italic type. The ratio of alternatively-expressed isoforms of the MSMB gene is altered in prostate cancer tissues. This boxplot gives the cancer status (benign prostatic hyperplasia or prostate adenocarcinoma) on the X-axis, and the ratio of MSMB1:MSMB2 isoform expression calculated relative to endogenous controls beta-2-microglobulin (B2M) and beta-glucorinidase (GUSB) on the Y-axis. Error bars represent the interquartile range (IQR) of the measurements. The level of significance as determined by pairwise Mann Whitney-U analyses is indicated. Outliers are indicated by circles. The ratio of alternatively-expressed isoforms of the HNF1B gene is altered in prostate cancer tissues. 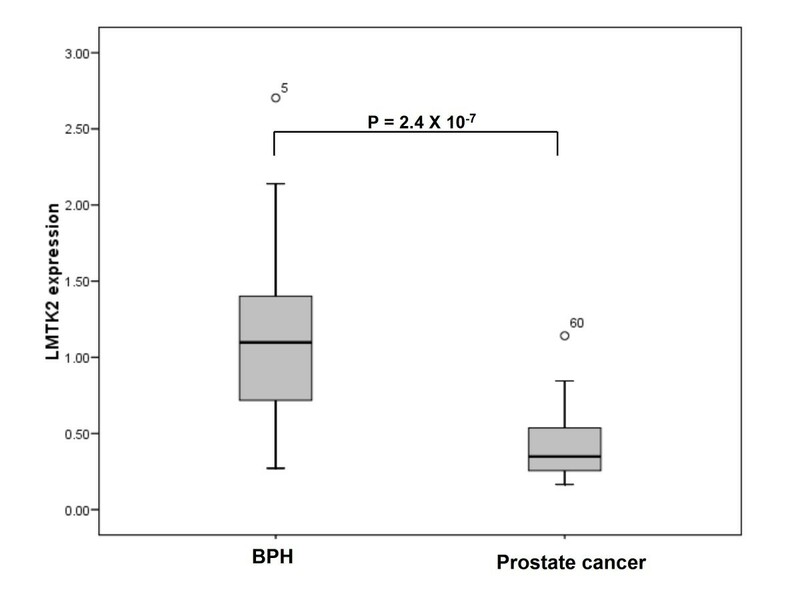 This boxplot gives the cancer status (benign prostatic hyperplasia or prostate adenocarcinoma) on the X-axis, and the ratio of HNF1B(B):HNF1B(C) isoform expression calculated relative to endogenous controls beta-2-microglobulin (B2M) and beta-glucorinidase (GUSB) on the Y-axis. Error bars represent the interquartile range (IQR) of the measurements. The level of significance as determined by pairwise Mann Whitney-U analyses is indicated. Outliers are indicated by circles. We report here that disruption of the amount or nature of transcripts expressed from the LMTK2, MSMB and HNF1B genes, identified in the genome wide scans for prostate cancer, may be important in the aetiology of this disorder. We identified a 68% reduction in the expression of the LMTK2 gene in prostate tissue with evidence of the presence of adenocarcinoma when compared with non-malignant BPH samples. Expression levels were 1.10 [IQR 0.77] in BPH versus 0.35 [IQR 0.30] in prostate cancer; p = 3.2 × 10-7). We also noted an effect of genotype at the LMTK2 variant rs6465657, identified in the GWAS as a susceptibility factor for prostate cancer whereby individuals carrying two alleles of the protective 'T' allele allelic status expressed almost a third less LMTK2 than did individuals carrying one or more 'C' alleles (P = 0.002). We suggest that this finding probably arises from a potential imbalance in the transcription or stability of rs6465657 alleles that we note upon allele-specific PCR (figure 1). The precise identity and mode of action of the functional variant tagged by rs6465657 is at present unknown, but It is reasonably easy to postulate that the 'C' allele at rs6465657 could be marking a loss-of-function variant with effects on LMTK2 half-life or function. The LMTK2 gene codes for a transmembrane serine/threonine/tyrosine kinase, with a role in endosomal membrane trafficking . It is also associated with NGF-TrkA signalling in murine brain, where it is a negative regulator of NGF-induced neuronal differentiation . LMTK2 interacts negatively with several other proteins with roles in cell division, such as protein phosphatase-1 (PP1C) and Inhibitor-2 (Inh2), which are part of a complex regulating separation of centrosomes during mitosis , and the cyclin-dependent kinase 5 (cdk5)/p35 complex , which has several functions, including a role in cell cycle progression. Recent studies have suggested that LMTK2 may interact with myosin IV, which has been shown to regulate both prostate specific antigen (PSA) and vascular endothelial growth factor (VEGF), both of which are associated with cancer. It is therefore likely that that reduction in the amount or activity of LMTK2 may lead to an increase in the proliferative capacity of prostate cells. We also report a potential role for alternative mRNA processing of the HNF1B and MSMB genes in the aetiology of prostate cancer. MSMB codes for a secreted seminoprotein, which has tumour suppressor properties and is thought to be silenced in prostate tumour tissues by the enhancer of zeste homolog 2 (EZH2) protein . Accordingly, MSMB expression has previously been reported to be a positive prognostic indicator in prostate cancer , although both these studies measured total, not isoform-specific expression levels. The MSMB gene produces 2 isoforms; MSMB1 and MSMB2, which arise from the skipping of exon 3 in MSMB2. This causes a frameshift effect leading to the production of 2 distinct proteins. Previous studies suggest that both MSMB1 and MSMB2 are present in normal prostate and normal gastric mucosa, but that MSMB2 is absent from the majority of a small series of gastric and prostatic carcinomas . This is mostly in agreement with our findings, which suggest a major shift in MSMB expression in association with prostate cancer. We found MSMB2 to be the predominant isoform in benign prostate tissue, although small amounts (~2%) of MSMB1 were also present. In prostate adenocarcinoma tissues, however, MSMB expression derived almost completely from MSMB1, which is present at 96% of total MSMB expression. These findings may indicate that the tumour suppressor properties of MSMB are derived from isoform MSMB2, and that MSMB1 isoforms are potentially pro-carcinogenic. This situation is not uncommon for alternatively spliced genes in cancer; the vascular endothelial growth factor (VEGF) gene has previously been shown to code for both pro- and anti- angiogenic isoforms, with different behaviours in tumour tissues . The HNF1B gene, which encodes three isoforms, HNF1B(A), HNF1B(B) and HNF1B(C), in humans , demonstrates a similar alteration to the relative balance of alternatively expressed isoforms associated with cancer of the prostate. The predominant isoform switches from HNF1B(C), which is expressed in non-malignant prostate tissues, to HNF1B(B) , which is expressed in prostate adenocarcinoma samples. HNF1B is a transcription factor expressed in a limited number of tissues, and has previously been associated with renal and ovarian tumours [32, 33] as well as prostate cancer . The HNF1B isoforms are known to exhibit differences in function and target specificities; Isoforms (A) and (B) are transcriptional activators whereas isoform HNF1B(C) is a transcriptional repressor . HNF1B isoforms have also been reported to activate different targets, for example, the HNF1B(C) isoform specifically has been demonstrated to negatively regulate the Glutahione-S-transferase A (GSTA) promoter, via a mechanism that involves Il-1beta . Given the difference in the transcriptional properties and target specificity of these isoforms, we predict that the alterations to HNF1B profile we note may manifest as an alteration to the overall activity of the HNF1B gene and/or activation of a variant set of its target genes. Our study provides good evidence that some of the GWAS associations for prostate cancer may be attributed to mRNA effects, but does have a number of caveats. We have chosen a single gene for analysis in the case of each GWAS variant. The variants may tag a large region containing many genes, some of which may also be good candidates. Other genes in the same linkage disequilibrium (D') blocks, or even further distant, could also be important. This was recently documented for the eye colour trait in humans, where variant rs12913832 located within intron 86 of the HERC2 gene exerts its effects not by moderating HERC2 activity, but by moderating the efficiency of the promoter of the neighboring OCA2 gene, located 21Kbp upstream . We have attempted to ensure we have chosen the correct gene on the basis of proximity and biological function, but other genes may also be affected. Our analysis was also based on comparison of samples from patients with prostate cancer, and samples from patients with non-malignant Benign Prostatic Hyperplasia (BPH), rather than a paired analysis due to the difficulty in obtaining normal prostate tissue from the cancer patients. Our results may thus be influenced by factors both within and between groups, such as ethnic origin or the use of antiandrogenic drugs. No differences in the ethnic makeup of the cancer and control cohorts were noted, with both being almost exclusively of Caucasian origin. Similarly, treatment with antiandrogens had a minimal impact on the expression of any of the transcripts studied; with the exception of CTBP2(1) and CTBP2(4) transcripts, which showed a trend towards lower expression in samples from prostate cancer patients treated with hormone therapy, although this result was not statistically significant and no correlations of the expression of either transcript with hormone therapy was noted in the BPH cohort. No effect of hormone therapy on LMTK2 expression, or on the ratio of MSMB or HNF1B transcripts was noted. In this study, we suggest that the overall mRNA expression level and/or the relative balance of alternatively expressed isoforms of the LMTK2, MSMB and HNF1B genes may be important determinants in the developments of prostate cancer, and demonstrate the importance of alternative mRNA processing mechanisms such as alternative splicing or differential use of polyadenylation sites in gene regulation. Our studies highlight a clear need for RNA studies to complement the genome wide association studies for prostate cancer and other diseases. We are grateful to the Northcott Devon Medical Foundation [grant number TB/MG/NO5002] for funding the study. We would like to thank the Peninsula NIHR Clinical Research Facility and the Exeter Tissue Bank for provision of BPH and prostate cancer samples. We would like to acknowledge Albert Hallsworth and Dr. Bridget Knight from Peninsula NIHR Clinical Research Facility for their excellent technical assistance, and particularly Neelima Bhupathiraju and Rob Bolt for help in gathering additional clinical details on the cohorts studied. We also thank Professor Tim Frayling for critical appraisal of the manuscript. LWH designed and executed the study, analysed results and drafted the manuscript. JRBP advised on polygenic aspects of the study and reviewed the manuscript. MC provided BPH and prostate adenocarcinoma samples and PM carried out the histological examination of tissues to prove malignancy. All authors read and approved the final submission.